When you’re a Disney fan for life it’s rather hard, and yet also rather easy, to find fault in their films. However, claiming that a new Disney film may beat out a lifetime favorite as your new number one is a bold claim… and one I’m willing to make when it comes to Disney’s live-action Beauty and the Beast. Let’s start with the cast performances. Luke Evans kills it as Gaston, and with a surprisingly well-trained voice to boot. In fact, Evans’ performance is so powerful that audiences might even feel empathy for the ever villainous Gaston which is saying a lot as Gaston’s portrayal is even more ravenous for murder and bloodshed than before. His confidant, LeFou (played by Josh Gad), has more heart than the animated version and seems to be sticking around for the eye candy aspect of the relationship leading to a few subtle sexual innuendos. However, the best part about LeFou is the writing – although hard to tell if some lines were by the writing team, or just clever improv by Josh Gad. Either way, comedy gold. Nothing out of the ordinary about the castle staff (Cogsworth, Chip, Mrs Potts, Wardrobe, Plumette, etc) until you reach the classic “Be Our Guest” number in which the superb CGI pairs with Ewan McGregor’s Lumiere vocal performance to deliver an Eddie Izzard in Across The Universe style show. Dan Stevens is the perfect beast. Kevin Kline’s approach to Belle’s father Maurice was refreshing. And Emma Watson, who may not be the strongest singer, was definitely the right choice for Belle with her independent bookworm charm (she mastered that as Hermione) and spirit for adventure. The high praise doesn’t end there though. The set dressing, costume design and CGI character design is worth screening the film several times alone, with subtle-yet-brilliant touches to the animated version and to each character’s real life back stories (like the Wardrobe, aka Madame Garderobe, being designed so that it looks like an opera house). And other than the one shot – when Belle first enters her new bedroom – that circles too quickly leaving the audience a little motion sick and the bedroom itself just a blur, the camera work was breathtaking. You may especially appreciate the little camera nods to other films – like The Sound of Music when Watson sings “Belle (reprise).” Which, speaking of music, you can’t go wrong with a soundtrack full of songs penned by composer Alan Menken with lyrics by Howard Ashman & Tim Rice. With that said, Beauty and the Beast is the darkest, most “gory” (there are gun shots and blood – oh my!) and risqué (in terms of character sexuality) Disney live action princess story we’ve seen yet. The final product is delivered on-screen in a very tasteful and respectable manner. 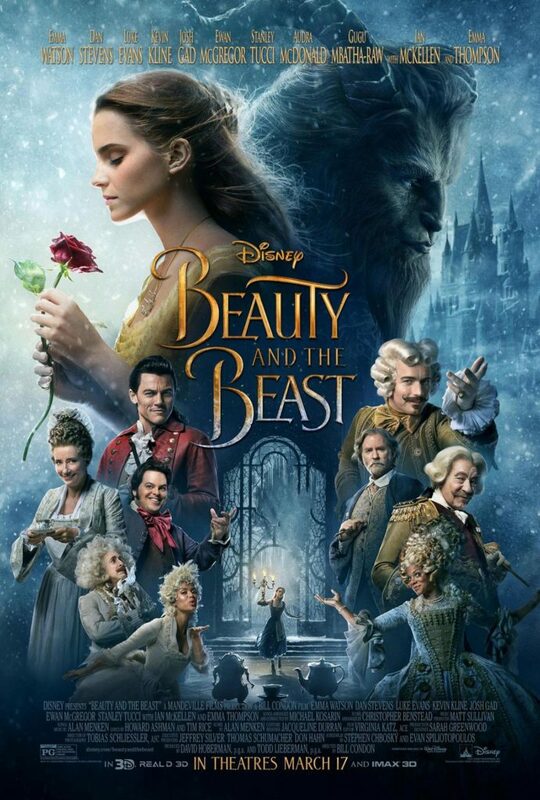 And while I’m still not certain where this film will safely land in my Disney Top 5, it’s safe to say that this version of Beauty and the Beast is hands down the best Disney film of my lifetime.